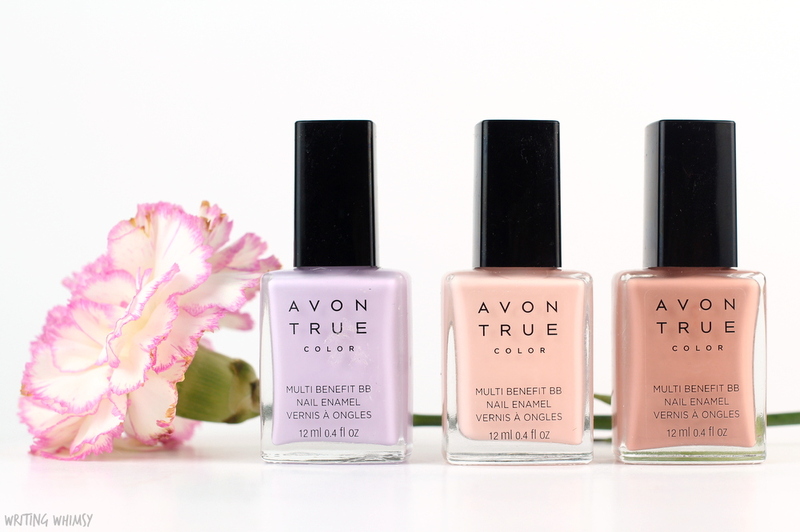 I’ve had great experiences with Avon nail polish so far so I was really intrigued by the brand new Avon True Color Multi Benefit BB Nail Enamel. While I’m a little confused by the “BB” in a polish, what it really means in this case is a polish with benefits. These shades have primer built in to help smooth ridges, which is a big issue of mine, and also promise to increase nail strength by 72%. There’s also a UV filter to help prevent yellowing and the polish contains vitamins c and e. There are three shades available and I tried out all of them. The Avon True Color Multi Benefit BB Nail Enamel in Lilac Love is a lilac cream polish with a flawless 2 coat formula. Pastels are often streaky on me but this one is opaque and smooth even without a ridge-filling base coat. The Avon True Color Multi Benefit BB Nail Enamel in Perfect Pink is a pale peachy pink cream polish. It’s a bit sheer and uneven at first but with three coats it looked great. The Avon True Color Multi Benefit BB Nail Enamel in Restoring Beige is a warm light caramel brown with a really great formula. I’m not usually a fan of beige-browns like this, but this is nearly opaque in one coat, although I had to go with two. There’s definitely something very professional-looking about it! Overall, while I haven’t tested the Avon True Color Multi Benefit BB Nail Enamels extensively enough to know if they actually improves my nails, but they do apply great. I’ll have to try to wear Lilac Love a few more times before summer disappears! Do you have a favourite from this trio?